And while that’s certainly accurate, the Windows division was not the company’s heart and soul as far as profits go, last quarter. The company made twice as much money last quarter from the Business Division, which is home to Office. And Microsoft’s Server and Tools group had bigger profits than the Windows division. The reason Windows profits were light is that Microsoft is in a transition from Windows 7 to Windows 8. Windows operating profit should pick back up once Windows 8 sales pick up this quarter into next year. The head of Groupon’s national sales, Lee Brown, is leaving the company. Reuters first broke the news last night after obtaining an internal memo and Groupon has since confirmed Brown’s departure. The memo was written by Groupon’s head of operations, Kal Raman. Raj Ruparell, head of Groupon Goods, will be taking over Brown’s position. Brown is the second top sales executive to depart Groupon this week. Jayna Cooke’s departure was made known three days ago; she was one of the company’s top salespeople who led the charge on major corporate accounts like Gap. “Under Lee’s management, the team has secured a number of key customers, and I’d like to personally thank Lee for his contributions and wish him the best in his next opportunity,” Raman wrote. Amazon.com has just launched its first social game, Living Classics, and unveiled a new division, Amazon Game Studios, which will launch similar titles. 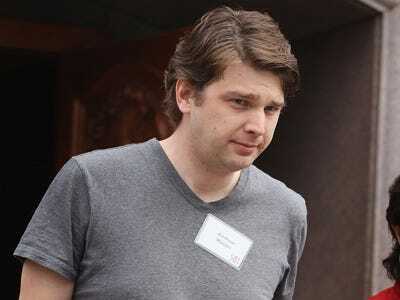 This means it has effectively declared war on Zynga during a vulnerable moment for the San Francisco-based game maker, which has seen its stock get hammered amid concerns over the growth of its Facebook-based social games. With the official reveal of Amazon Game Studios, the battle is on. We don’t think Amazon has a particular beef with Zynga. Instead, we think that Amazon wants to make sure it has an ample supply of games for its Kindle tablets. And just as it’s gotten into book publishing to ensure a supply of affordable e-books for the Kindle, Amazon likely felt it needed to become a first-party publisher of games. 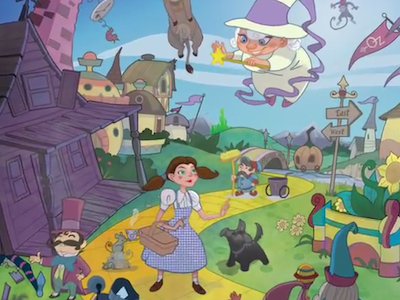 Here’s a look at Living Classics, which puts players in well-known imaginary worlds like that of The Wizard of Oz and Alice in Wonderland. In light of recent scandals, it’s hard not to see this as a bit of image rehabilitation, but we’ll do our best to take it at face value. News Corp is bringing its 18-month-old educational division to the fore by rebranding it Amplify and teaming up with AT&T to put tablets in the hands of students. The unit will focus on developing products and services tailored for classrooms, ranging from kindergarten through high school. And, at the center of that ecosystem, will be the Amplify Tablet (which, judging from the video below, appears to be a modified Galaxy Tab). Videos, encyclopedia entries, books and even remote tutoring apps will all be just a tap away. 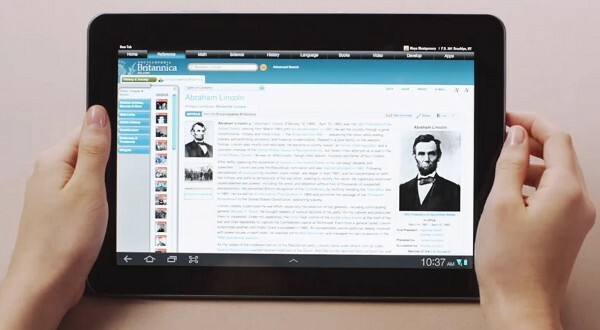 The tablets will get their first trial run in the US during the 2012-2013 school year. With the phone hacking scandal behind him, former New York City school chancellor Joel Klein (who headed up News Corp’s internal investigation), is free to focus on getting Amplify rolling and into classrooms across the nation. Before you head off, make sure to watch the clip from AT&T after the break. Ne ws Corp launches Amplify educational unit, with help from AT&T (video) originally appeared on Engadget on Mon, 23 Jul 2012 13:30:00 EDT. Please see our terms for use of feeds. There is a slight wrinkle to this quarter’s edition of the Microsoft online money pit chart. The company took a $6.2 billion writedown from its failed aQuantive acquisition, which means we get an even more ridiculous looking than usual chart. If you back out the writedown, Microsoft had an operating loss of $472 million. One quarter Microsoft is going to get this turned around. We can’t wait. Other than the online division, the company is doing very well. It beat on EPS, and just barely missed on revenue. 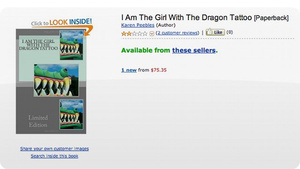 If you search for popular books on Amazon, it turns out you’ll turn up intentionally misleading knockoffs. Publishers obviously aren’t happy about about it, but some of these titles are hilarious. I Am The Girl With The Dragon Tattoo, anybody? Seriously, who falls for that? Apparently, a lot of people. Fortune found a slew of these ripoffs on Amazon. Currently, the online retailer’s bestselling book Fifty Shades of Grey by E.L. James. If you’d been searching for the popular romance novel would you have been fooled by the very similar Thirty-Five Shades of Grey by J.D. Lyte? Maybe, actually! 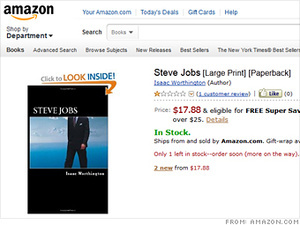 It’s perhaps more shocking that Amazon (AMZN) not only sells the books, it’s also helping their authors create them. All of the apparent copycat books that Fortune found on Amazon were made through CreateSpace, which is a division of Amazon. Authors can use CreateSpace’s system to design and self-publish their own books. The books then go on sale on Amazon and other sites. Amazon splits the proceeds with authors. It’s a different relationship than most publishers have with their authors, but there is no way for consumers to know that. On Amazon and other sites, CreateSpace is listed as the publisher of the books. Unfortunately some of the best knockoffs are no longer available as far as we can tell. According to Fortune, Steve Jobs by Isaac Worthington was tearing up the charts on Amazon at one point, but we haven’t been able to find it. Funny or Die is going commercial by, well, creating commercials. The Adam McKay and Will Ferrell brainchild, which had a humble start in 2007 (featuring videos of drunken landlord babies) and then exploded into a celebrity-laden viral video machine, is launching a division called Gifted Youth that is entirely dedicated to making real advertisements. While some products have been integrated into videos—like Emma Stone’s “ad” for iPhone murder apps—it wasn’t done to sell anything. So far, brands have served as excuses to make funny videos. Now they’re going to be the main event. Chris Bruss, the vp/branded entertainment at Funny or Die who will helm Gifted Youth, told the New York Times that the division will give agencies and marketers the coveted opportunity to work with writers, directors, and maybe even actors who have worked with Funny or Die. Advertising agencies are constantly trying to create the next big viral video. While once in a blue moon a client will sign off on Old Spice guy, let’s face it, moons are rarely blue and agencies are far more likely to make Mary J. Blige sing about fried chicken in a Burger King ad that is destined to get pulled. Funny or Die, on the other hand, epically wins at viral content. For example, Will Ferrell’s local Super Bowl ads for Milwaukee beer—spawned from a deal that Pabst made with Funny or Die in 2010—got more Twitter mentions than $3.5 million national Super Bowl spots for Cadillac, Century 21, CareerBuilder, Lexus, and Hulu. But everyone shouldn’t start dancing in the street just yet. While Funny or Die is good at creating funny content, it’s a whole other ball game when you have a client that’s going to have to approve content every step of the way. 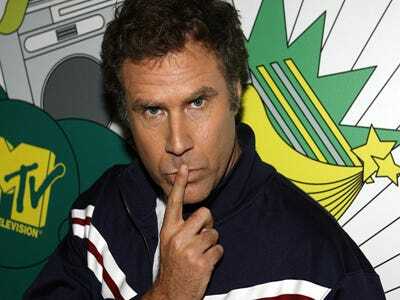 Who’s really going to be able to tell Will Ferrell, for example, what he can and can’t say? We’re also anticipating that agencies, who just love working/competing with new creatives on the block, will be butting heads with Gifted Youth. The new ad shop had a soft launch during TNT’s slam dunk contest during the NBA All-Star weekend by airing a Kia commercial starring Blake Griffin and actor Jeff Goldblum. Gifted Youth also just released spots for New Era baseball caps in which comedians Nick Offerman and Craig Robinson fight over their respective love for the Chicago Cubs and Chicago White Socks. (This is a continuation of last year’s ads in which John Krasinski and Alec Baldwin feud about the Red Socks and the Yankees). Sony is a company famous for its consumer electronics like flat screen tvs, computers, and the PlayStation. But, incredibly, that’s not how it makes money. Dan Frommer of SplatF points out the company loses hundreds of millions from consumer electronics. It actually makes money from its “financial services” division, which is made up of insurance and banking services. 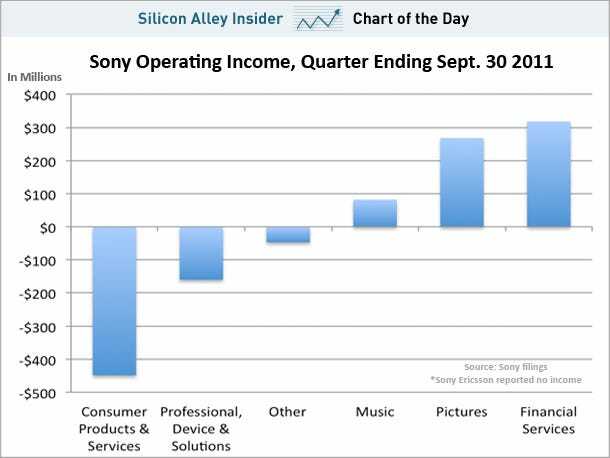 Below is a breakdown of the operating income for each of its divisions in the most recent quarter. Whoa. TechCrunch reports that Google has invested between $100 and $200 million in Zynga, the social gaming behemoth behind Farmville, Mafia Wars, and others, in preparation for the launch of Google Games later this year. TechCrunch’s “multiple sources” say that Google itself, not its venture capital division Google Ventures, has invested between $100 and $200 million in Zynga, a huge power play presumably with the aim of eroding Facebook’s social media dominance. It seems that Google sees Zynga as the best way to hit the ground running with Google Games, a social gaming service from the search company that’s set to launch later this year. TechCrunch points to this job opening for “Product Management Leader, Games” at their Mountain View campus as proof that we’ll be seeing a lot more about Google’s move into gaming in the near future.